baroque centre to rival Rome. Witness Mount Etna, Europe's largest active volcano. Marvel at the riches of Syracuse, home of Archimedes and one of ancient Greece's richest cities. 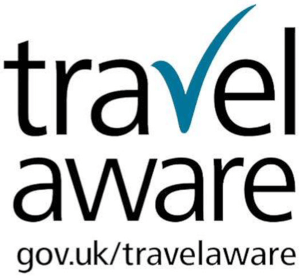 A checked luggage allowance is included in the cost of all holidays. Allowances vary by airline and are subject to change. Full details will be provided with your travel documents, or for more information please contact our Reservations Team. "I have just returned from your Sicily tour. It was fabulous. The itinerary was perfect. All the major sites far exceeded my expectations – which were already high before I travelled!!" "What an exciting and educational week steeped in history and told to us by our tour guide Ruth in her own enthusiastic and passionate style. Every day was an adventure and we feel we have returned home with a wealth of knowledge. " Sicily has been at the crossroads of almost every Mediterranean civilisation for thousands of years, leaving the island with traces of their culture, architecture, and history. In character, Sicilians are markedly different from the rest of Italians, with their own Sicilian language and dialects, as well as a uniquely vibrant cuisine. Influences come from Africa as well as Europe for its food and culture. Sicily’s landscape is just as varied, with rugged, snow-capped mountains, meadows of wildflowers, citrus and olive groves, and a stunning coastline with red volcanic rocks and wide sweeping bays. From the ancient Greeks to the Romans, Moors, Normans, Spanish, French, and finally Italians, the island has absorbed so much culture and history, and their relics can be seen all over the island from ancient amphitheatres to monasteries, temples, villas, and more. Italians are famous for being friendly and accommodating, and Sicilians especially so, so there is no doubt you will be made welcome on this beautiful island. You should arrive at the airport to take your flight to Catania. On arrival a coach will take us to the hotel, where we stay for three nights with breakfast and dinner. Depending on the date of departure you will stay at either the Kaos Hotel or the Hotel Baia di Ulisse. Chosen for it's quiet location and stunnning views. Chosen for its relaxing coastal location. This morning we visit what can truly be described as one of the wonders of the ancient world: the amazing Greek remains in the Valley of the Temples. There are six of them in total, situated largely on a ridge looking out to sea. Visible for miles and standing proud as they do, they must have made a statement of sheer absolute power and confidence to any passing mariner or shepherd, leaving none in doubt as to who were the masters. The best of them, Concordia, similar in design to the Parthenon in Athens, is almost perfectly preserved, with just the roof missing. With its wonderful tapering columns and beautiful light golden colour it is absolutely captivating. One can only wonder as to what was going through the builders’ minds thousands of years ago, toiling under a hot sun whilst creating a masterpiece. We enjoy a guided tour of the site and you may also visit the excellent museum, displaying finds from both the temples and surrounding area, including a unique collection of vases. We also visit Agrigento itself, awash with medieval atmosphere, swimming in tiny stepped streets and quiet shady piazzas overlooking the blue Mediterranean in the distance. We return to our hotel during the afternoon to relax. Today we visit the north coast of the island and during our journey we will experience some wonderful scenery. A rugged wild landscape, scorched by the sun and remarkably empty of both man and beast. Firstly we visit the magnificent Benedictine Abbey at Monreale, founded in the 12th century. Still used today, it boasts outstanding medieval mosaics covering almost the entire interior, depicting stories from the Old Testament. If you can manage the steps to the roof you will have a superb panoramic view of Palermo below, the surrounding countryside and onwards to the sea. The cloisters are another highlight, surrounded by columns, no two of which are alike, almost Moorish in appearance. During the afternoon we visit Sicily’s capital, Palermo, which under Saracen and Norman rule became one of the most important cities in Europe, famous for the wealth of its court and as a great centre of learning. Today it has more of a 17th century appearance and during our visit we will pass the Norman Palace, a gorgeous former Royal residence, now the seat of the regional government and see the Cathedral dating from the 10th century. We return to our hotel for dinner. We leave Agrigento and take the drive to the small town of Piazza Armerina, where one of the most amazing archaeological discoveries of the last century was made: a 4th century Roman villa, possibly owned by one of the joint Emperors, which explains its size and richness of decoration. Buried for centuries, you can still see the remains of pastel-coloured frescoes on the walls, but the mosaics, showing animals and hunting scenes, are simply the finest we have from Roman antiquity. This palatial building, complete with its baths, illustrates with great clarity the evident high standard of living of the Roman elite. We have a guided tour of the villa before continuing our drive to Taormina. Neighbouring Taormina is Giardini Naxos, a charming typically Sicilian town with a seashore lined by seafood restaurants and fishing boats drawn up onto the beach and the beautiful family run fourstar Hotel Sant’Alphio Garden, situated just a few minutes’ walk from the sea itself. 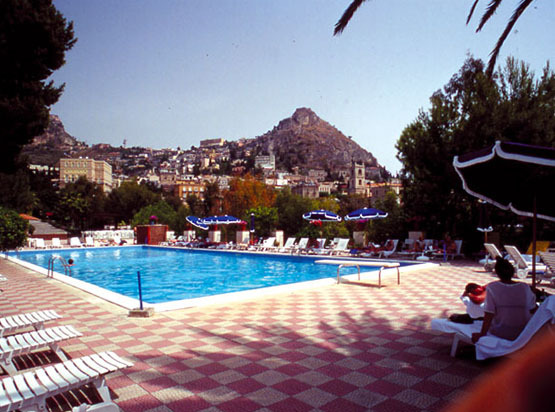 This hotel sits in a very picturesque spot with views of nearby Taormina and Mount Etna. 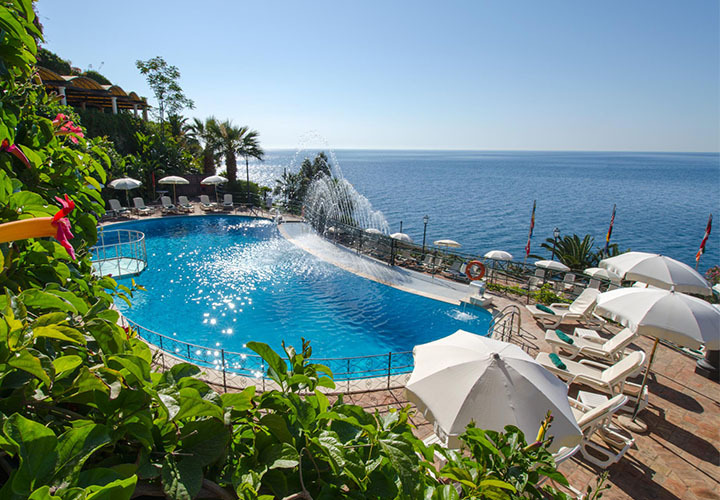 In Taormina itself, you can choose the four-star Hotel Excelsior Palace, a classic building, over a hundred years old, which during its long history has welcomed guests as diverse as the King of Italy to Antonio Banderas! It is superbly situated on a promontory with panoramic views of the sea to one side and Mount Etna on the other, set in its own lush, extensive landscape gardens and yet centrally located in the old town. Finally, just eight kilometres north of Taormina, built in Sicilian style and set into the coastal cliff itself, overlooking the stunning Bay of Taormina, is the luxurious, four-star Hotel Baia Taormina. It is a member of ‘Charming Hotels – Independent Luxury Hotels of the World’ one of the world’s most stylish hotel chains. This superb hotel with its stone-faced walls, terracotta tiles and wide arches has a wonderful welcoming atmosphere. Outdoor pools are open summer months, weather permitting. Chosen for its ideal seafront location. Chosen for its central location in Taormina. Chosen for its welcoming atmosphere and picturesque location. This morning we are free in Taormina, one of the smartest and most exclusive small towns in Italy – it has everything! 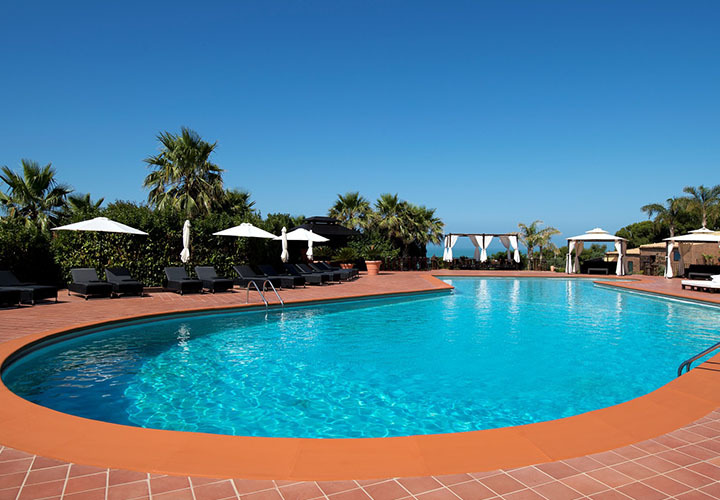 Retaining much of its medieval charm, wonderfully situated on a high balcony, facing Etna and overlooking the sea, it is renowned for its beautiful gardens and charming atmosphere. Today, its main street is lined by smart, designer boutiques and exclusive jewellers, with the tiny side streets, some of which are so narrow you can touch both sides at once, leading to intimate piazzas, lined with atmospheric family-run restaurants. As you would expect in a country so famous for its cuisine, speciality food shops are everywhere, selling fresh pasta, olives, Sicilian wine and the local Marsala. Taormina’s greatest claim to fame is its amazing theatre, a legacy of the ancient Greeks and still in use today. Wonderfully preserved with its panoramic view of Etna in the background; to attend one of the occasional classical music concerts in this most special of venues must rank as one of life’s more pleasurable moments. This afternoon you are free to explore as you wish. Today we take the drive to Siracusa, once one of the richest and most beautiful cities in the ancient world, even rivalling Athens. Its most famous resident was Archimedes, that genius of a man who, whilst in the bath discovered the principle of displacement, ran through the streets naked, exclaiming “Eureka” (I’ve found it!) in a story that has entered folklore. Today the city is one of Sicily’s most attractive, a wonderful collection of limestone buildings, dating mainly from the 17th and 18th centuries. There is an extraordinary Baroque Cathedral incorporating an ancient temple, with a lovely interior, and just opposite is the Bosco Palace. The old port area is extremely attractive and very traditional, full of small fishing boats unloading their catch. You will be free to explore the old town at the eastern end of the city, called Ortygia; actually an island, connected to mainland by three bridges. You will have the option to take a boat trip around the bay before returning to the hotel. Dominating eastern Sicily is Europe’s highest volcano, Etna, and this morning we take the drive to as near to the snow-capped summit as possible. Ascending the winding road, the landscape becomes increasingly eerie and alien, with razor sharp black rocks in contorted formations, and some areas devoid of almost all vegetation. As we near the cable car station itself you can enjoy extensive views over the whole area. Subject to certain regulations you will have the opportunity to take the cable car, jeep and guide to explore even higher levels. We return to our hotel during the afternoon. At the appropriate time a coach will return us to the airport to take our return flight home after a very varied tour. Want to print out the itinerary or share with a friend? "When I was young my plan was to travel the world, but Sicily is so fascinating that it keeps calling me back; I've been visiting for 46 years and I still haven't seen everything it has to offer." Why should I choose Riviera Travel? We care deeply about our customers and the holiday experience they have. We’re passionate about travel and we want all aspects to be perfect, with personal service and attention at every step of the way. Our world-class holidays include everything you need, with no detail overlooked. We carefully curate every aspect of your trip based on our own first-hand experience and expertise built up over decades in the travel industry. The price is per person, based on two people sharing a twin room. Single and sea view rooms are also available at a supplement. 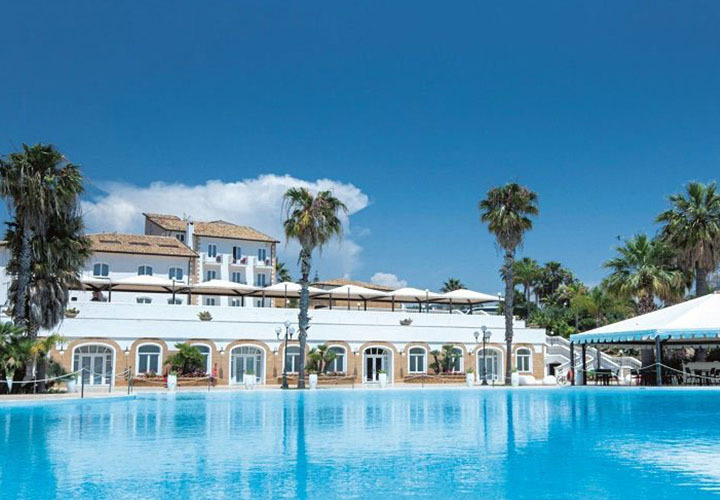 Return flights are included, along with airport departure taxes and transfers, local accommodation taxes, and seven nights stay with breakfast and dinner. All guided tours as mentioned, as well as the serviced of your Riviera Travel tour manager. We guarantee there are never any hidden costs or surcharges, inflated prices or artificial discounts. This tour is offered on a half board basis, meaning the only meal not included is lunch, allowing you the opportunity to eat out like a local and discover the culinary delights of Sicily yourself. The above experiences are payable locally. Can I personalise my holiday? There are no personalise your holiday experiences for this tour. Requests to pre-book your seat are subject to the airlines conditions. If you would like to pre-book seats please contact our Reservations Team, we will be able to provide further information regarding the possibility and also the cost. No visa is required for British citizens visiting Sicily, however you should ensure your passport is valid for 6 months beyond the return date to the UK. Other nationalities should contact the appropriate embassy. 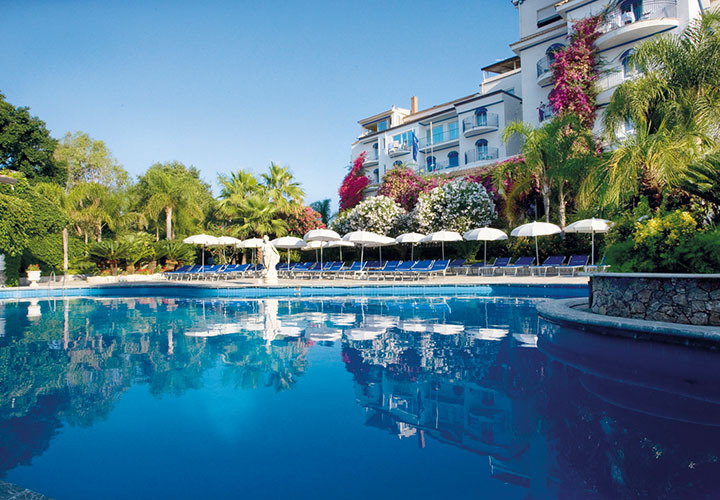 Where hotels feature a swimming pool, pools are open in the summer months weather permitting. 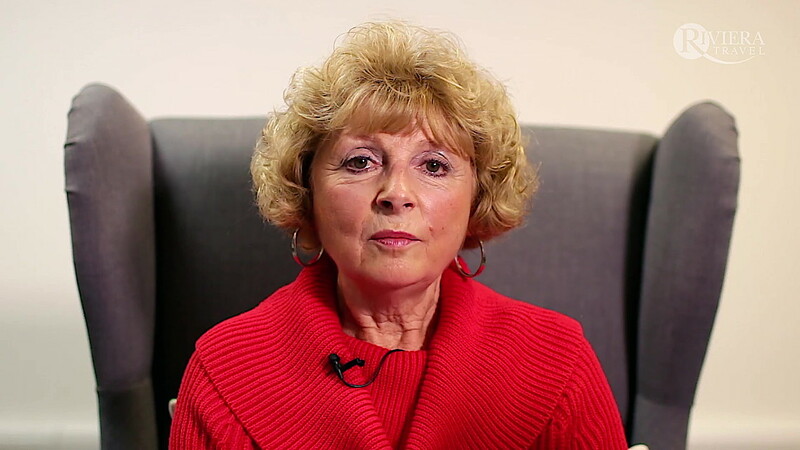 "As with my previous tour with Riviera, it was a very enjoyable experience. Our guide, Rosario, was outstanding - nothing was any trouble for him to help us reap the benefits of the history and archaeology of the Sicilian tour. My appreciation of Sicily has been greatly enhanced. Thank you for such a well organised holiday."